Working on this piece just felt right. Piecing together odds and ends that I have collected in my studio- either found or made by myself or given to me. 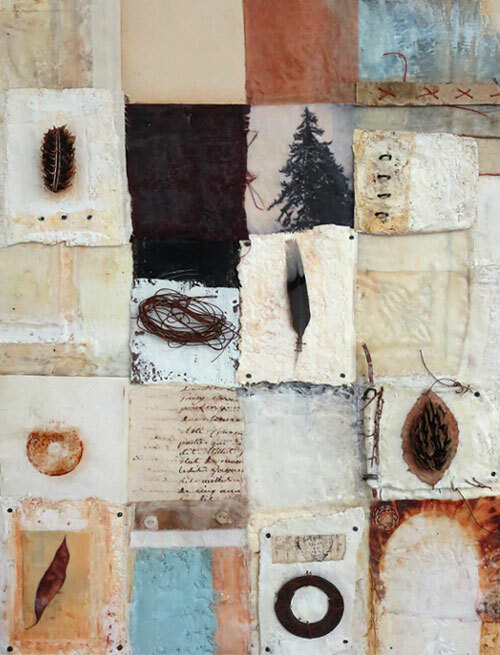 I incorporated textiles, rusted cloth, hand stitch cloth, metal, a photo, nails, plaster, old book pages, encaustic paint and medium. When I work on these types of pieces I often feel like a bird, building and weaving together a nest- but a home of images and paint and things to transmit an idea or feeling. A home of what is earthy, what is natural, what brings balance and strength. Feet firmly planted in the earth. The title comes from Toni Morrison’s book Beloved, which profoundly affected me when I first read it in high school and then even more so when I read it again in college. I probably should reread it again and it will have another effect on me, now that I am a mother. There’s a line in the book that has stayed with me all these years. He is perfectly describing the kind of love that returns a person back to him or herself. Love is usually thought of as something that is possessive…but here he describes a love that is generous and puts things back right, especially in an often cruel and inhumane world. I have always thought of my art and nature in that way actually. It helps me return to myself. Such a moving book. And your piece does it justice! Thanks debra. It is definitely a book that stays with you!